Happy Patient and Dental Implants Warranty? We have it! 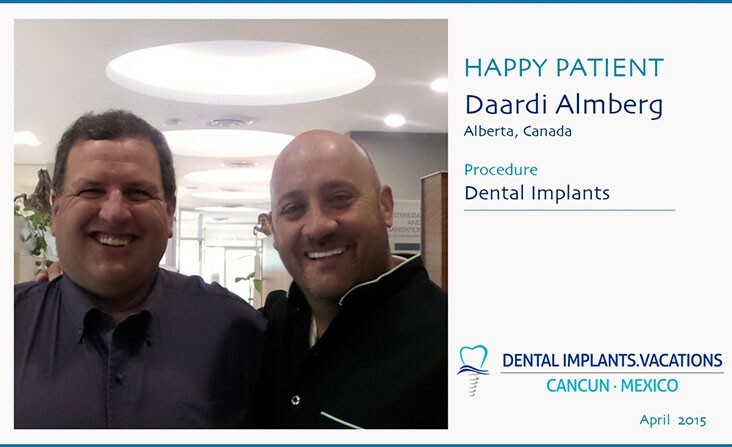 We want to thank the visit of our patient Daardi Almberg, from Alberta, Canada. This is the second time he had come with us at our dental clinic in Cancun for Dental Implants. He needed to change one of his dental implants and everything went without a hitch. He made use of our 5 year warranty for dental implants. As long as you have followed the oral hygiene indications as the doctor had explained you during your first appointment, you shouldn’t have any problem with replacing a dental piece at no extra charge.